The following description of Saloons of Polonia at the Turn of the Century was written by John Daniels, Director of the Buffalo Social Survey. It orginially ran in the Buffalo Illustrated Morning Times newspaper on January 23, 1910. Adam's Tavern, Buffalo, New York, 1933. 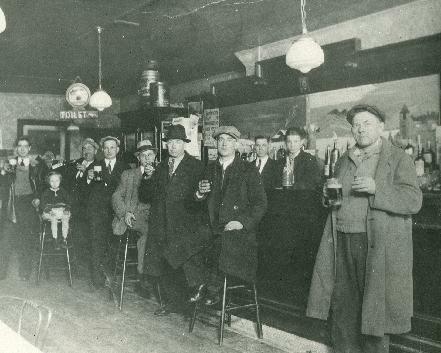 The regulars returned to Adam's Tavern, 1012 Sycamore (at Loepere) to hoist some brews and, it would appear, a shot or two as well shortly after the repeal of Prohibition in 1933. Adam Pilarz, proprietor, stands behind the bar along side his son John. The family ran the tavern from 1924 until 1949. Thank you to Ed Pilarz for sharing this priceless family picture.